Yes, this Alexander Wang jacket was probably made by the slaves he keeps in his sweatshop in Manhattan. But can we really blame him for chaining his workers to their sewing machines for 90+ hours a week. I mean, look at what a great job they do. 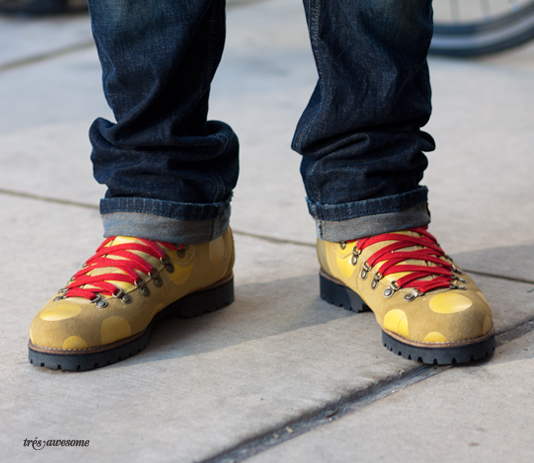 I heart these Jeremy Scott x Adidas work boots. They are positively minimalist when compared with the other pair I shot from the collection a couple of weeks ago. This Chicago street style was captured in the Gold Coast. Need these boots. Thanks for posting! Cool style! I'm with you - love those boots. oh my, what a beautiful man. so effortless and cool. and those boots! i almost bought some jeremy scott for adidas ballet flats the other day - the patent ones with wings! but alas - the sizing's too small. and they didn't have them bigger. shame! "But can we really blame him for chaining his workers to their sewing machines for 90+ hours a week. I mean, look at what a great job they do." Why would you try and make light of this? Casually reproaching this unfolding situation while still indulging in the end product is the definition of insincere. I agree w/Sephora above me. I love Alexander Wang everything..and I'm all for sarcasm and witty (sometimes well thought out..in this case..sometimes not)commentary..but really?